The European Union Fiscal Stability Treaty referendum, held on 30th May 2012, was carried by a margin of 955,091 to 626,907, amounting to a percentage vote share of 60.37% for the Yes side. This was lower than the vote share won by the Yes side in other recent European Treaty referendum campaigns that were carried but was of course higher than the share won in the 2001 Nice Treaty and 2008 Lisbon Treaty referendum elections (Figure 1). In addition to those who voted Yes or No, there were 7,206 spoilt votes nationally for this election, amounting in total to a turnout level nationally of 1,588,204, amounting to a percentage turnout level of 50.53%. 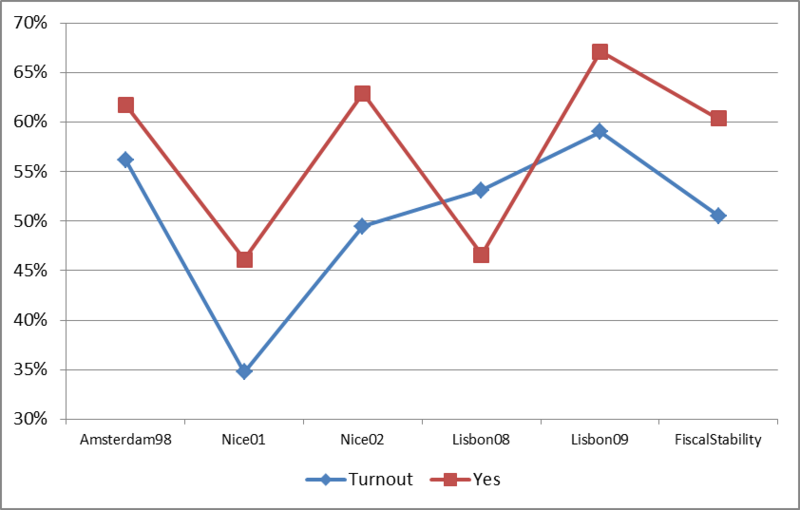 This level was lower than the levels attained for the two Lisbon Treaty referendum elections, but higher than those attained in the two Nice Treaty referendum elections (Figure 1). The highest turnout levels were again recorded in the more middle class Dublin constituencies (Figure 2b), with lower than average turnout levels recorded in a number of rural constituencies (Figure 2a) and with the lowest turnout levels again being registered in the two Donegal constituencies. Turnout levels in Dublin (average of 53.4%) were significantly higher than in the rest of the state (49.6%), with average turnout levels of 50.4% in both Leinster and Munster but a low average turnout of 47.2% for the Connacht-Ulster region. As noted in the previous post, this is more or less the mirror image of the turnout patterns usually associated with local and general elections but it is in keeping with the general geography of turnouts for referendum elections. The constituency with the highest turnout level in this election was Dublin North-Central (58.8%), just ahead of Wicklow (57.5%), Dun Laoghaire (57.2%) and Dublin South (57.1%), with levels for these constituencies a significant level higher than those for the next highest constituencies, Tipperary North (54.0%) and Cork South-Central (53.5%). The lowest turnout levels nationally were again recorded in Donegal, with the lowest turnout nationally being recorded in Donegal South-West (41.9%) with turnout levels in Donegal North-East being somewhat higher at 42.6%. Turnouts in Donegal were significantly lower than those in the constituencies with the next lowest turnout levels nationally, Cork East (46.6%), Longford-Westmeath (46.8%) and Galway East (46.8%). Within Dublin, turnouts were again higher in the more middle class constituencies (55.3%) than in the more working class constituencies (50.8%), but it is worth noting that the turnout levels in the more working class constituencies was higher than the national average while the average turnout in these constituencies would have been three percent lower than the national average in the 2009 Lisbon referendum. 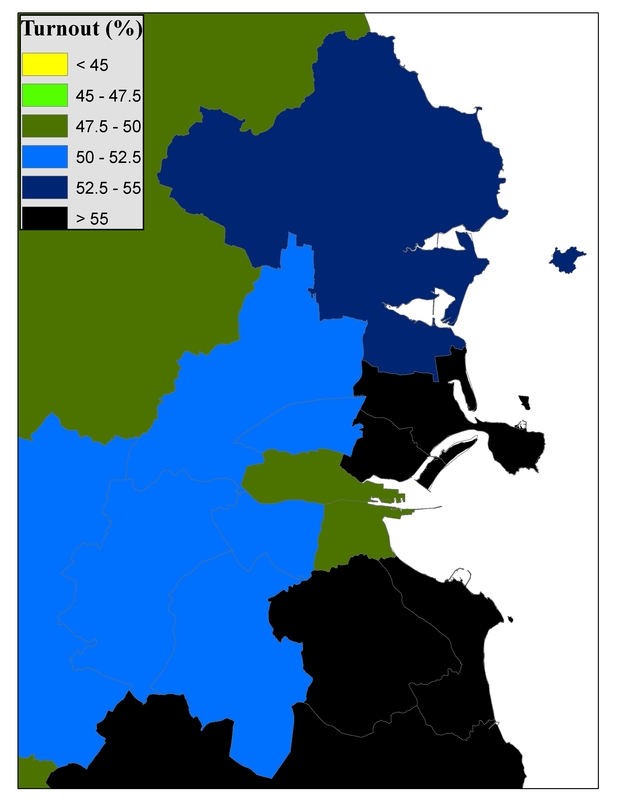 As such the drop in turnout levels relative to the second Lisbon referendum was not as marked in the working class Dublin constituencies (5.2%) as it was in the middle class Dublin constituencies (7.9%) or in the areas outside Dublin (9.1%). The region with the highest Yes vote in percentage terms was Munster (62.3%) with the lowest share being recorded in Connacht-Ulster (58.2%). The level of support for the referendum was slightly higher than the national average in Dublin (60.5%), but very significant differences existed between the level of support for the referendum in the more middle class constituencies (70.0%) than in the more working class constituencies (49.6%). 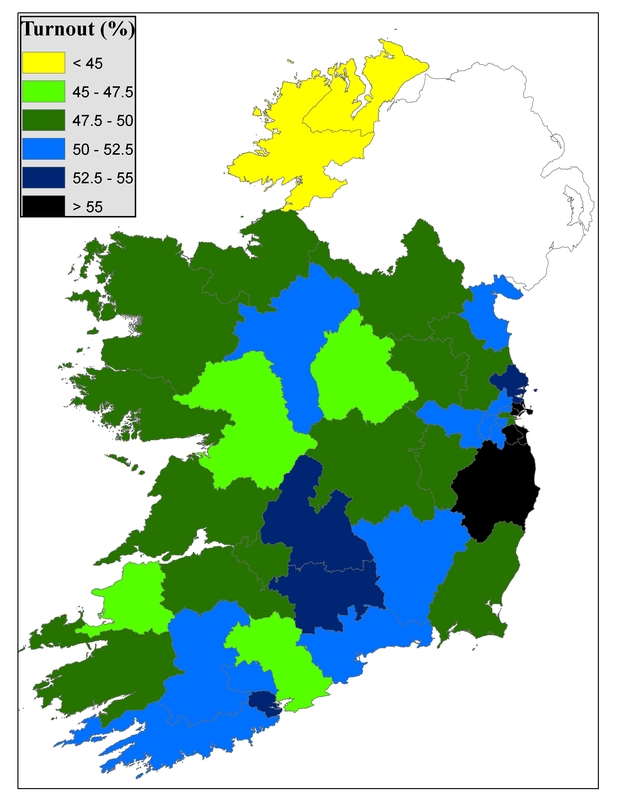 As Figure 2c shows, the constituency with the highest level of support for the referendum was Dublin South (75.8%), just ahead of neighbouring Dublin South (74.2%), with strong support for the referendum also being recorded in Dublin South-East (72.3%), Mayo (67.2%), Cork South-West (66.2%) and Limerick (66.1%). 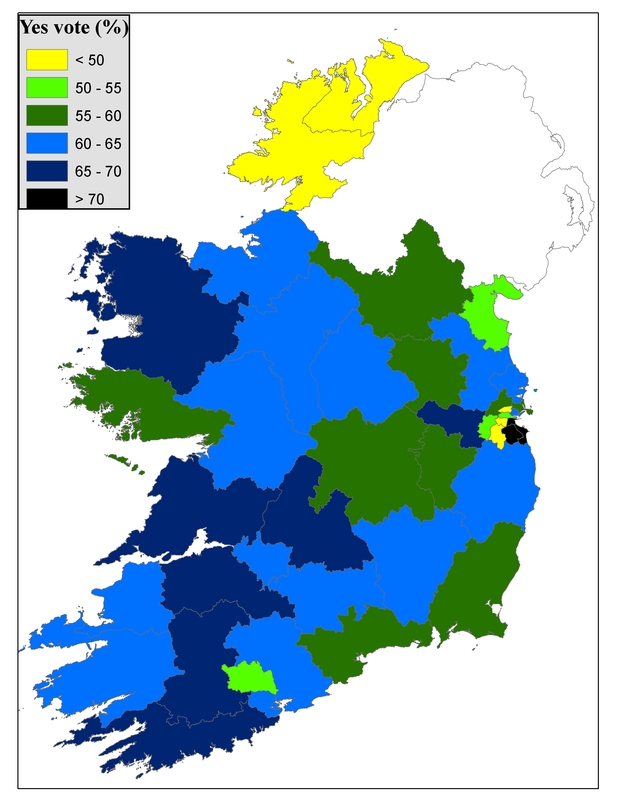 The constituency with the lowest level of support for the referendum was Donegal North-East (44.4%), just ahead of neighbouring Donegal South-West (45.1%), with the No side aklso carrying the day in the three most working class Dublin constituencies, Dublin North-West (46.8%), Dublin South-Central (49.1%) and Dublin South-West (49.3%), as illustrated by Figure 2d. 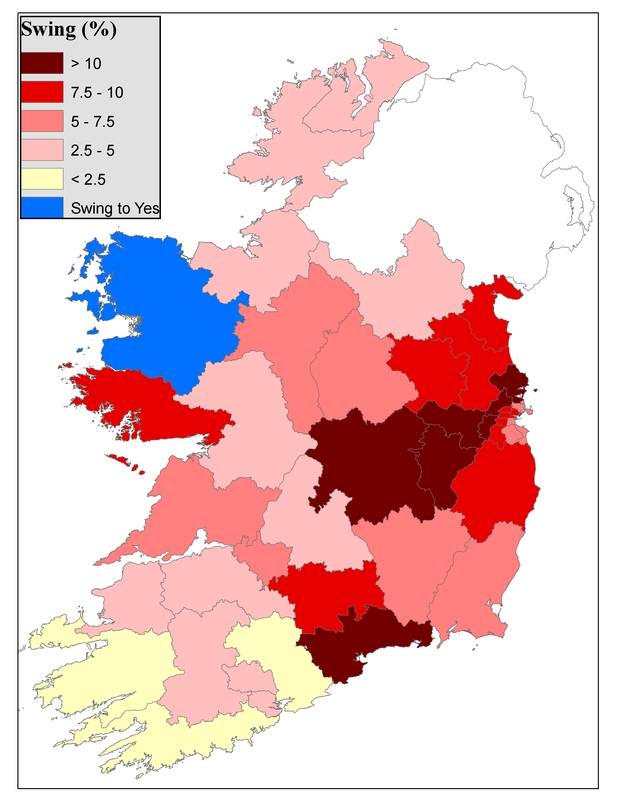 Relative to the results for the 2009 Lisbon Treaty referendum, only one constituency (Mayo, with a 5.5% swing to the Yes side) saw an increase in the percentage share of the vote won by the Yes side although the swing from Yes to No was relatively small in Cork South-West , Cork East and Kerry South (Figure 3). These would have been constituencies where Fine Gael tended to do especially well in at General Election 2011. Figure 3: Difference between percentages voting Yes in the 2012 European Union Fiscal Stability and 2009 Lisbon Treaty referendum elections. The biggest swing to the No side was in Laois-Offaly where the percentage of people supporting the referendum was down by 13.5% relative to the result for the 2009 Lisbon Treaty referendum. 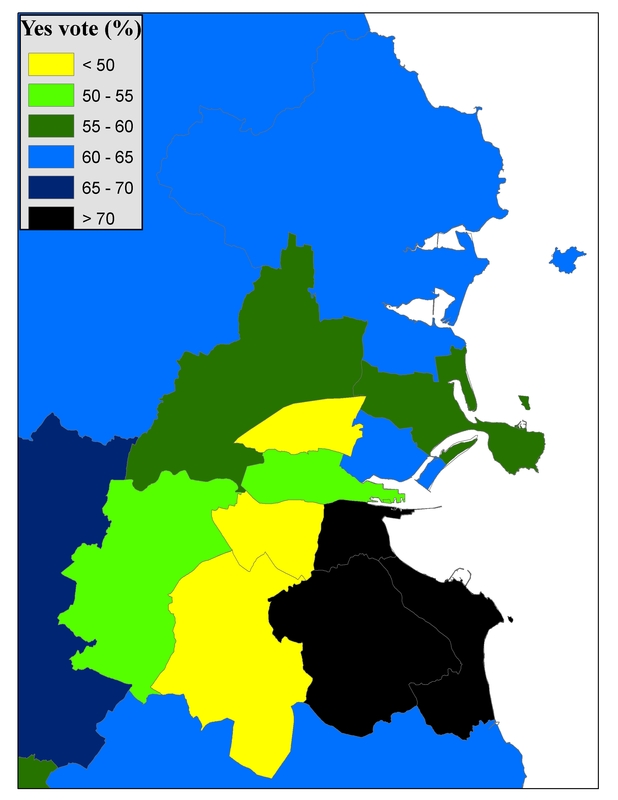 There was also a significant swing towards the No side in Waterford, as well as in the “breakfast roll man” commuter-belt constituencies in Kildare, Meath and the suburban Dublin constituencies of Dublin North, Dublin West and Dublin Mid West (Figure 3). This entry was posted in Election data, Electoral Geography (voting maps), Referendum elections, Voter turnout and tagged 2012, maps, referenda, voter turnout. Bookmark the permalink.